Since 1981, Dr. William Parks has offered natural health care for patients of all ages in Monroe and the surrounding area. Our original location was on South Monroe Street. Shortly after, we were at Telegraph Road for over two decades. We’ve since moved to our present location on North Monroe Street. Let us help you and your family discover your natural healing abilities! 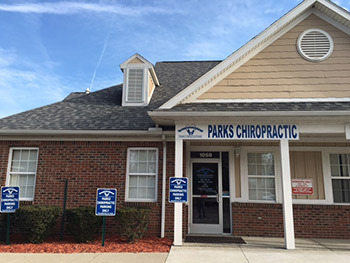 Welcome to Parks Chiropractic Health Center! Our practice is based on the idea that we treat you like members of our family. You’ll receive the same recommendations from Dr. Parks that he would give to his own family. We give our patients the optimal care they need to get well. During the course of treatment, we’ll work to meet your goals. Along the way, Dr. Parks and our team educate you on preventing future problems so that you can make the best decision for yourself. From infants to grandparents, our practice is ready to help any condition or concern. Pregnant women can see a great benefit from the Webster Technique. As a fellow with the International Chiropractic Pediatric Association, Dr. Parks is highly skilled in helping his younger patients. Your child’s spine doubles in the first two years of age when they’re going through the stress of learning to stand, sit and walk. With small traumas placed on their spine, chiropractors can check and monitor their alignment before unhealthy patterns are formed that could take years to undo. Additionally, seniors have seen many common problems clear up with the help of chiropractic. Some of our patients are 70-80 years old and walked into our office with a cane. A couple of weeks later, they’re walking around without it! “I saw a patient when she needed help in high school. After she was married and had her own family, she moved back to the Monroe area. She called our office to discuss her son, who was bothered by colic. Feeling unsure of whether chiropractic could help, she asked what the proper age was to begin getting adjusted. I assured her that I could see infants from the moment they were born. You shouldn’t have to wait to have your health concerns addressed. Contact our office today and experience short waiting times and same-day appointments!